GLENS FALLS — It’s no secret that Panama leans on each member of its roster for consistent contributions. 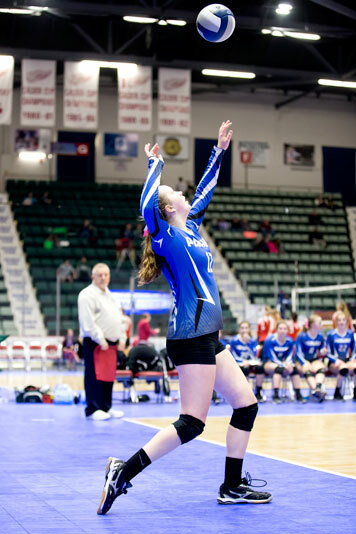 The fact that every one of the Lady Panthers can be counted on to produce on the hardwood has certainly made them tough to contain or stop, as they entered Saturday’s semifinal pool play at the New York State Public High School Athletic Association Volleyball Championships with an unblemished overall record. And it’s that supreme balance that now has the Lady Panthers on the cusp of a state title. 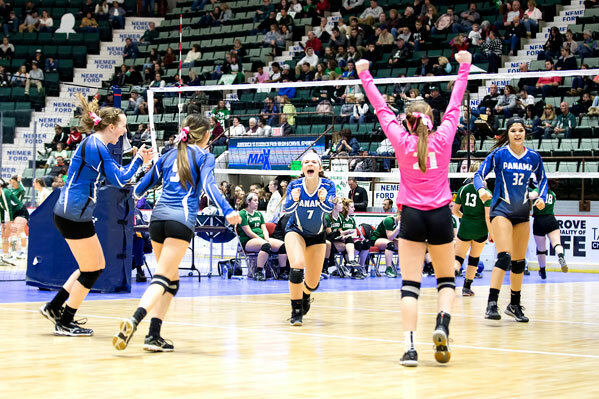 All in all, Panama stormed its way through pool play in Class D at the Glens Falls Civic Center, compiling a flawless 6-0 record and posting wins over Section IX’s Tuxedo (25-18 and 25-9), Section II’s Argyle (25-16 and 25-16) and Section III’s Bishop Ludden (25-17 and 25-21). That stellar play also allowed the Lady Panthers to lock up a spot in today’s Class D championship, which is set to begin at noon. 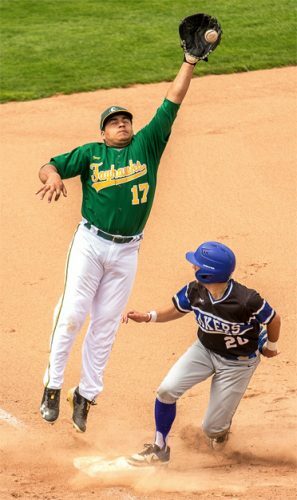 Panama’s first matchup of pool play came bright and early following the opening ceremonies against Tuxedo. 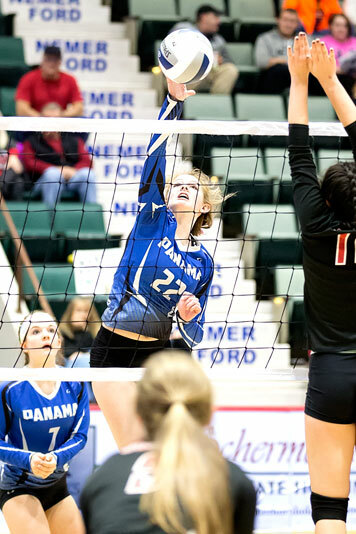 After a relatively close first game where the Lady Panthers prevailed 25-18, the Tornadoes were no match for Panama in the second game, falling 25-9. Madalyn Bowen collected seven digs, six kills and three points against Tuxedo. In addition, Elle Angeletti (five points, five aces), Natalie Angeletti (five kills, six digs, nine points and one ace), Alexys Marsh (five kills, one block), Tara Sweeney (three kills, one dig, six points), Gillian Figueroa (three kills, two blocks), Quinn Payne (21 assists, two digs, one kill, four points and one ace) and Maci Johnson (five digs, two points, once ace) all played integral roles. Those first two victories in Hosier’s eyes were imperative. They alleviated some of the nerves that were prevalent for her girls prior to their first-ever appearance at the state championships. Next up for Panama was Argyle. The Scots, just as Tuxedo tried to do, hung with Panama, but the Lady Panthers found their rhythm, closing the first game on a huge run and opening the second game on a 7-0 run en route to two 25-16 wins. 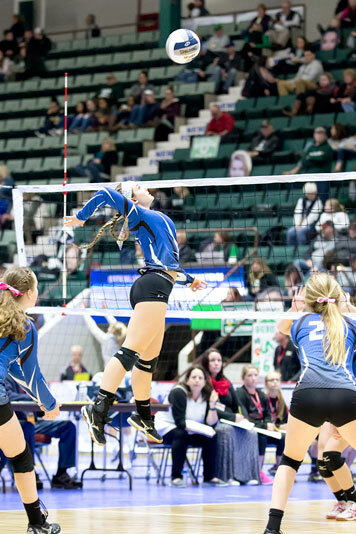 Payne tallied 22 assists, six digs, two kills, nine points and three aces to help Panama take down Argyle. Also, Sweeney had six digs, one assist, two kills, 10 points and three aces; Bowen added 11 digs, one assist, nine kills, one point and one ace; Natalie Angeletti contributed three digs, one assist and eight kills; Johnson compiled three digs, four points and three aces; Figueroa had one dig, one kill and two blocks; Marsh came through with five kills; and Elle Angeletti had one dig, six points and three aces. 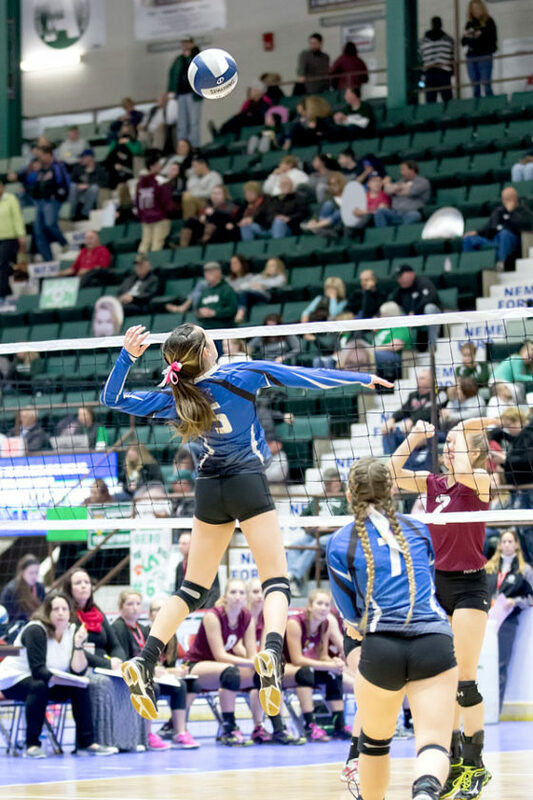 Finally, Panama’s last action of pool play came against the Gaelic Knights of Bishop Ludden, which was arguably the toughest bout of the day for the Lady Panthers. The Gaelic Knights tested Panama, but again, the Lady Panthers found a way to come away with two more wins, 25-17 and 25-21, to close the day at 6-0. 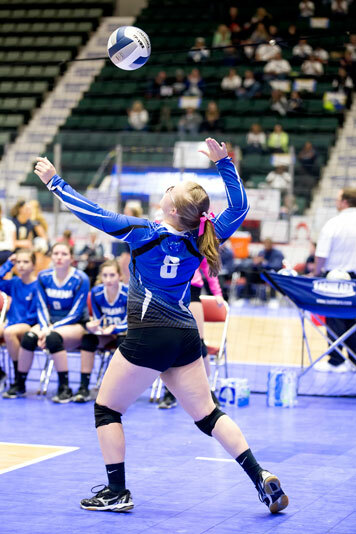 Sweeney, Panama’s lone senior, had eight digs, one assist, two kills, nine points and one ace against Bishop Ludden. Johnson (seven digs, seven points, three aces), Marsh (three kills, three blocks), Natalie Angeletti (three digs, eight kills, one block, three aces), Payne (six digs, 19 assists, two kills, four points, one ace) and Bowen (13 digs, nine kills, four points) helped the Lady Panthers end pool play still undefeated. Awaiting Panama in the championship tilt will be Argyle, which compiled an overall record of 4-2 in pool play, with both losses coming courtesy of the Lady Panthers. Danielle Sill (229 kills, 59 aces, 186 digs), Alicen Simpson (140 kills, 33 aces, 34 total blocks), Alaina Keating (94 kills, 36 total blocks) and Jessie Wilson (476 assists) had been some of the statistical leaders for the Scots heading into Saturday’s action. “They were very scrappy,” Hosier said of the challenges Argyle may present. “We just have to play our game and try to find those open spots and keep playing. … It’s about us. If we play our game, everybody plays their role, we’ll be state champions.